i.e. athough the overall shape is quite simple, it took quite a lot of planning to get it set up just the way I wanted. I hope you can see the wavy line appearing. In my mind it is a river of plain weave between the huck lace areas, but perhaps it is the other way around? I have — or think I have — enough warp for two scarves in different weft colours, and then I plan to make another warp at the redder end of the serious spectrum to experiment further. I’m thinking of them as colour studies disguised as finished objects. By the way, having cut off and washed the sample piece, I wasn’t at all sure about the single ends in orange. However, S said he liked them so they stayed. I’m still not sure, but if I were then I wouldn’t need to try it, would I? Alas it is still only Friday morning and there are several more hours until the weekend, so I had better get back to my sums and the-proof-that-isn’t-there. Sigh. That is so cool! I love the pattern! It is subtle until you really know where it is and then it is just lovely! Hi there – you have been busy with posts just lately !! I love the colours in your weaving and yes I can see the wavy line appearing. The different textures give a great effect. I am sure the scarf will drape nicely when it’s finished. I need to learn from your example and start to take samples off the loom and wash them rather than just checking for threading errors and ploughing ahead regardless – that’s the completer/finisher in me ! 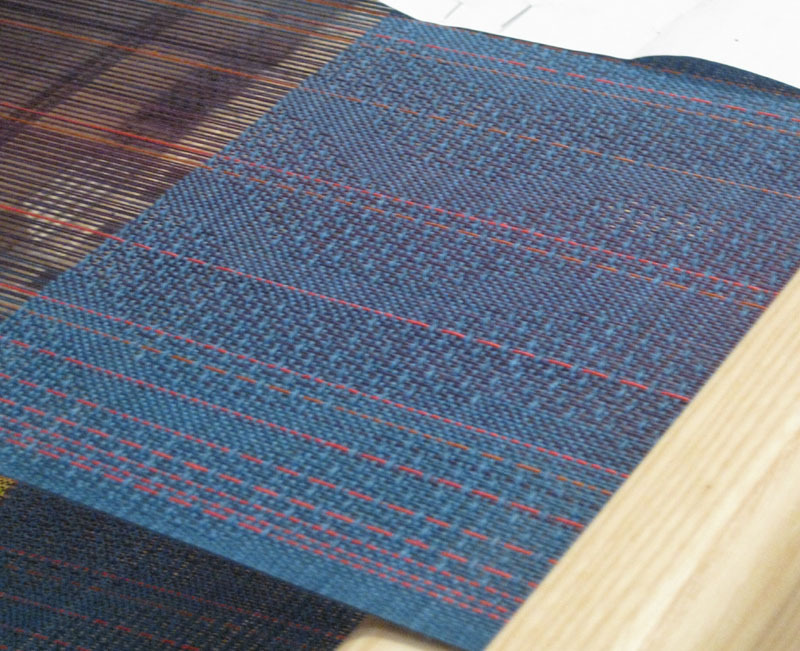 Hope you got some work done today and happy weekend weaving ! Cally, that’s seriously lovely. The wavy pattern of the huck lace apparent and wonderfully subtle. I like your wavy pattern in your weaving here. And the orange, I think you would miss something when it was not there. It adds a bit of excitement to the warp. Just blue would make it may be very subtle.